With its distinctive design, the new Huckins Sportﬁsherman 45 celebrates the company’s 75-plus years as builders of desirable custom wooden ﬁshing and cruising boats. Wombat is powered by twin 480-hp Cummins diesels turning Zeus pod drives, which help her achieve top end speeds of 35 knots burning 50.5 gph, or cruise comfortably at 28 knots and sip fuel more efficiently at 33 gph. Wombat’s low and graceful hull (LOA 44’10”; Beam 13’9″; Draft 3′; Displ. 23,000 lbs.) is a cored ﬁberglass composite structure, with a full-on ﬁshing cockpit that features three insulated ﬁ sh bins with in-drain macerators, a Dometic icemaker, a mid-cockpit rocket launcher for stand-up angling, and Rupp outriggers. 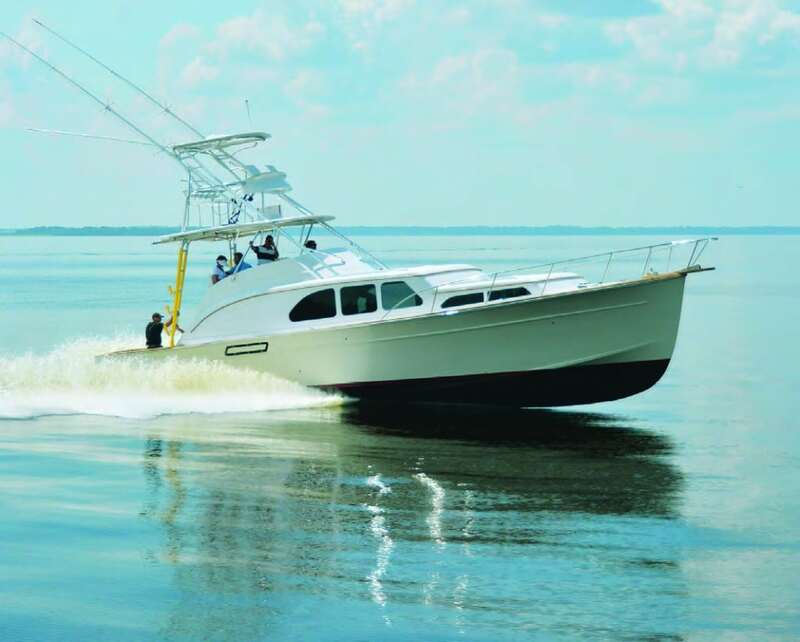 The company’s trademark Quadraconic® hull has a solid reputation for smooth running and minimal pounding compared to other hulls.